I couldn’t agree more!! Far too often people are generally complacent (or even cavalier) about the dangers involved with severe storms. 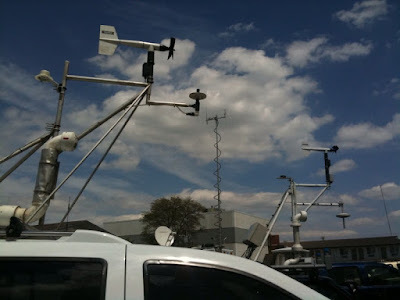 I firmly believe that those who live in the aforementioned areas should not only have weather radios with built in auto-alert signals (most modern ones do) and tune in to local media and/or The Weather Channel (the latter especially for larger events/outbreaks) but also have a BASIC understanding of where they (and their loved ones) are relative to any incoming severe storms. This is referred to as “situational awareness” and, when combined with a solid safety plan, WILL save your life. On the night of the 3rd, I had the rare luck of capturing a less frequently photographed form of lightning called a bolt from the blue. Such super-bolts, while spectacular to witness and document, are absolutely lethal and destructive as they possess about 10X the charge of the more common negative bolt. Also referred to as dry lightning, they have caused many fatalities and millions of dollars in damage. The visible lightning discharge (return stroke) originates within the storm’s upper glaciated anvil which holds solid hydrometeors (ice crystals & hail/graupel) that carry positive charge. The initial stepped leader sets off as an intracloud bolt within the positively charged upper anvil/tower region before traveling outward up to several miles then down towards an unsuspecting target on the negatively charged ground. Positive bolts are the most highly charged and long-lasting form of lightning. While the average common negative bolt carries enough energy to light a 10-watt bulb for 2 months, a positive bolt can release enough energy to light a 100-watt bulb for almost a century! Lightning strikes of this kind are surpassed in rarity only by ball lightning, which I personally have yet to witness. Captured with Canon 40D in northeast Colorado. Exposure time: 23 sec., ISO 100, Canon EF-S 10-22mm zoom. 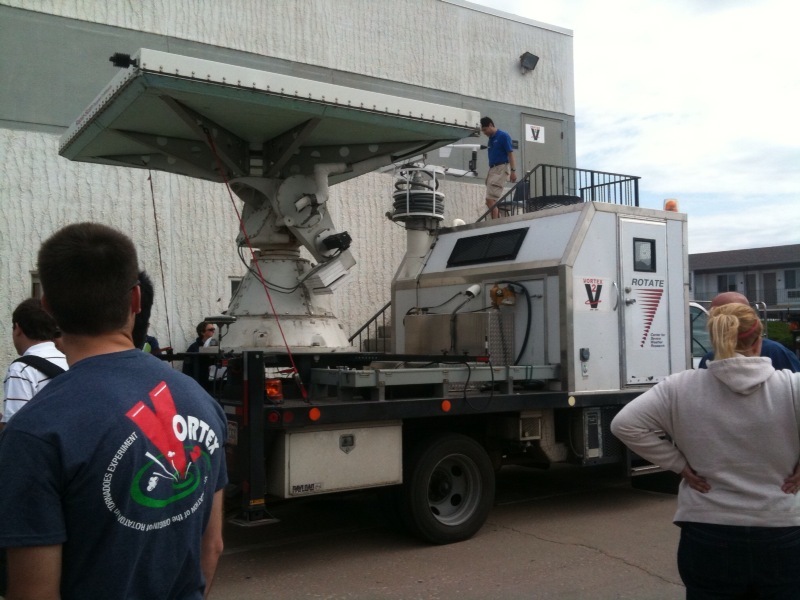 During the week of July 11th, the eastern Colorado and Front Range urban corridor were hit by some of the most powerful storms in memory. The strong late-summertime high situated over the southern and central plains enhanced the monsoonal moisture pattern, pushing deep moisture normally seen only across the lower central Plains during the height of storm season all the way up to the mountains. The deeper moisture naturally combined with strong daytime heating, with several days pushing highs towards the century mark, and an unusually mild upper air pattern with the jet stream situated well north toward the Canada border to create ideal conditions for slow moving, flooding storms with tremendous lightning. While the storms were mostly non-tornadic (only one supercell with tornado reports which happened over some barren fields well southeast of Denver), the ferocious lighting shows more than made up for it!! Above is an awesome strike I captured from the comfort of my back yard on the night of the 13th! In my opinion, that night represented the height of the prolific storms pattern with dazzling displays of non-stop strikes of every kind that moved almost over downtown Denver as with the previous night. The storms then drifted northward over the southeastern part of town where they lost no strength! As I followed carefully through Aurora and up to I-70 east, I witnessed just how powerful electrified it was! Lucky Shots of Overshooting Towers! So last week I felt SORELY disappointed that I wouldn’t be able to chase what the forecast models had predicted would be the second real tornado outbreak of the year. Both the long range (GFS) AND medium-short range (NAM) showed the classic signs of a negatively tilted trough & associated jet streak complete with subtropical jet to pull out onto the southern Plains right over deep moisture classic to a healthy May starting Wednesday and moving slowly eastwards into the end of the week. Unfortunately a business trip to Chicago– starting ON Wednesday and going for a day & a half — was mandatory. 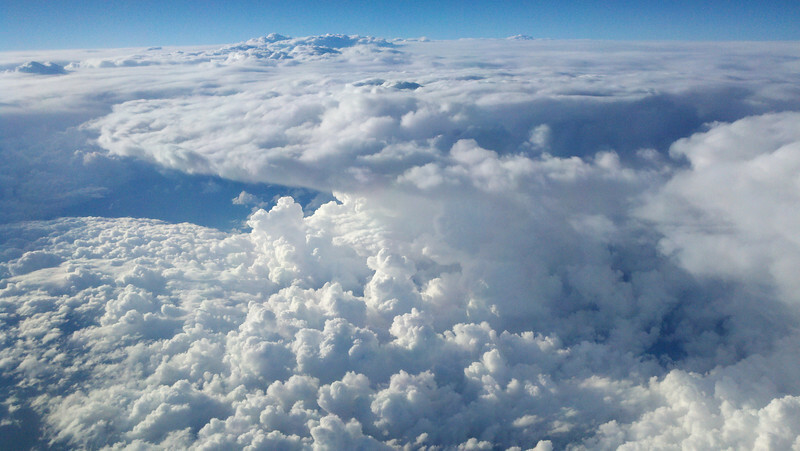 I had a sneaking suspicion that Chicago & areas along our flight one way or the other would likely see at least some storms, and thankfully was not disappointed! Courtesy of my DROID X! These failed to produce any tornadoes (at the time at least), but had plenty of awesome classic supercellular structures! Four twisters were reported earlier, but they were all further north along & just north of I-80 between 3-4pm. 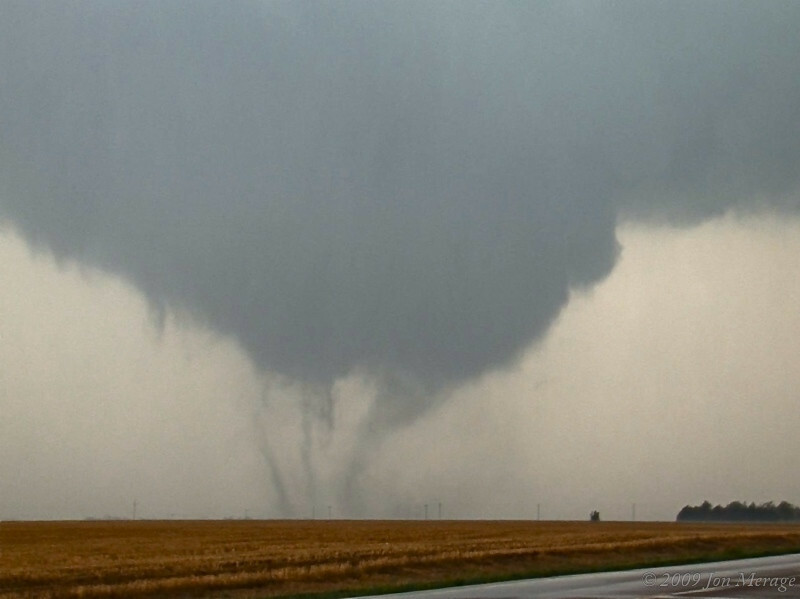 305 separate tornado touchdowns in two waves of outbreaks over a 3-day period. Two E-F5s, 12 E-F4s, and TWENTY-ONE E-F3 tornadoes!! Damage paths across long swaths of land from east Texas to Virginia, covering most of the southeast U.S. region known as “Dixie Alley”, an area outside the proverbial & traditional “Tornado Alley” which has seen more deaths per capita than anywhere in the nation. One particularly violent storm spawned from this monstrous “super-outbreak”, infamously known as the Tuscaloosa-Birmingham tornado, was tracked and covered live by numerous media outlets including The Weather Channel, had a maximum width of 1.5 miles and an astounding 80 MILE path of destruction, very sadly inflicting a confirmed 65 fatalities, a new record from a single tornado since March 1925. The endless streams of images, videos & dramatic survivor accounts have once again left the nation with a sad, sobering image of what a “Super-Outbreak” looks like, and the ongoing NEED to continue to develop advanced warning systems with which to not just continually warn, but EDUCATE the public. On the positive side, the Storm Prediction Center had issued categorical risks days before the outbreak, clearly highlighting the general areas most at risk, and then worked diligently with the local NWS offices in issuing warnings on some 90% of storms that produced tornadoes with an average lead time of twenty-five minutes. As expected, NWS Aberdeen has officially rated the Bowdle tornado an EF4 with wind speeds between 170-200 mph!! 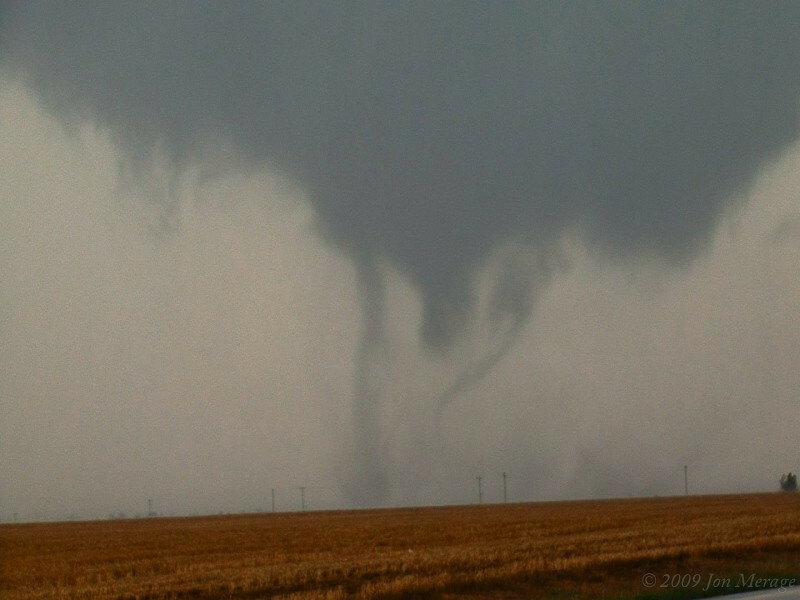 That makes our second certifiable EF4 (Quinter, KS of May ’08 the first) and my personal third! The first EF4 I experienced (not so much “witnessed” due to after-dark) being the famous Hoisington, Kansas tornado of April 21, 2001. NWS described damages some which we personally witnessed (from up-close) such as “major damage to walls with roof removed” to one residence just north of town and “widespread tree damage with many of the trees completely debarked” which is impressive considering trees have a generally slim profile, and MOST IMPORTANTLY, “2 garages completely destroyed with the concrete slab wiped clean” and “ground scouring visible along the path of the electrical towers” which we witnessed and recorded. Those descriptions are hallmarks of strong-violent tornadoes. Lastly the path length, duration, and width of the vortex (estimated at one-half mile wide) defined the strength of it all! While we didn’t have a chance to revisit the damaged areas we knew such things had occurred having witnessed the furious and violent storm motions at all levels. All features of the supercell from the moment of mesocyclogenesis through its apocalyptic maturity with a massive striated buzzsaw appearance and screaming inflow jets feeding the storm throughout the mid-levels of the atmosphere screamed violent. It was as if this storm just situated itself over one spot and had nothing to do but spin out of control. I will post many more pictures soon. It’s been some time since I’ve posted here…the storm season has so far been unusually benign and with final VORTEX2 preparations underway the forecast once again calls for a long week of chasing, documenting and studying whichever monster supercells we’ll be able to keep up with. While our excitement levels are surging to an electrifying peak this week’s forecast models depict an alarming situation for damaging storms with potentially numerous powerful tornadoes poised to leave lengthy paths of destruction across the heart of tornado alley– uncomfortably close to populated & congested metropolitan areas. The usual speculations exist of strong tornadoes and/or large hail hitting town centers like Oklahoma City or surrounding suburbs and further north/northeast into southern Kansas & eventually beyond. One of the higher concerns for our research armada and the nearby communities will be fast storm motions with forecasts now showing storm speeds of around 40 kts (nearly 50 mph!). Needless to say, such speeds on likely destructive tornadic storms going into the night is unnerving. This year, our role as vehicle Probe 8 will be sampling the small & short-lived Descending Reflectivity Core, inflow and surging mini gust front as it travels cyclonically around the tornado and moves toward and eventually into the storm’s dark core. Our Professors at the OU School of Meteorology have a renewed focus in this area which they believe to hold key information as to the strong thermodynamics & locations of specific air masses circulating around the tornado. More info on this soon. Since this bonafide publicity stunt/attention seeking fiasco first started (and escalated out of control faster than a speeding rocket), I have been questioned about this little story by more than a few people, friends and family alike. Most of them simply asked what validity if any there was to their story, and whether I knew of this so-called family. First off: I can understand when a couple of REAL storm chasers land a same-day interview on Larry King Live to tout their ‘phenomenal’ accomplishment of getting video from inside a tornado (vis-a-vis SevereStudios.com last year). I can also understand and even appreciate when major news networks tune in to one or two storm chasers tracking the eye of a devastating hurricane making landfall on a Gulf coast. What I cannot understand, appreciate, or have much respect for is when a major, “reputable”, 24/7 network–like CNN–chooses to devour a senseless story like the Heene fabrication and over-sensationalize the hell out of it while falsely reporting the “family” as so-called storm chasers (or “weather chasers”, as the local Denver stations called them, LOL!!). Now, while the infamous Larry King interview (conducted by Wolf Blitzer? ?…hmmm) was ultimately the first unraveling of their pathetic scheme, the manner in which CNN stumbled all over itself to give the Heene’s their exclusive worldwide broadcast–EXACTLY as they had planned earlier this year–is just another sorry example of the broadcast media’s ineptitude (both local & national) in choosing QUALITY pieces to report on & disseminate, brashly clamoring for the first ‘interesting’ or noteworthy story. Secondly: How can I put this one more simply…WHY WOULD SO MANY NETWORKS AND STATIONS PLASTER THIS ALL OVER THEIR CHANNELS WITHOUT CROSS-CHECKING THEIR SOURCES & REFERENCES?? Sure it made for a dramatic and tantalizing piece as it was claimed, but to be blunt this one just made everyone look damn stupid!